Semco Dispensing Guns For Semkits And Semco Cartridges. The Semco model 510 high pressure injection gun is capable of post assembly injection of high viscosity groove injection sealing compounds into confined areas and voids, including channel sealing and areas that require material to be injected through small orifices under pressure. It is designed to accept materials prepackaged in Semco 6 oz. cartridges or the 6 oz. Semkit® package. 8 oz. and 20 oz. retainers are optional. The ram rod has a diameter of 5/16″ and a stroke of 1-1 /2 “. The gun is available in a manual or reciprocating version. 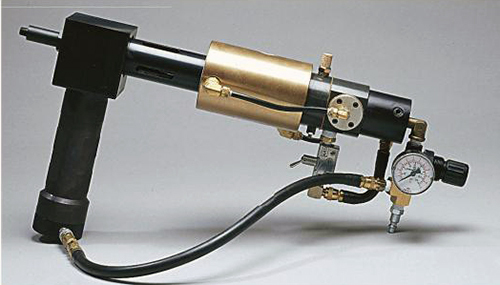 The reciprocating gun provides a continuous bead of material when actuated. The pressure produced is 110 times line pressure used and the maximum pressure rating is 11,000 psi. 231068 510-HP gun reciprocating, 6 oz. 230892 510-HP gun manual, 8 oz. 231069 510-HP gun reciprocating, 8 oz. 231872 510-HP gun manual, 20 oz. 231070 510-HP gun reciprocating, 20 oz. The model 510 gun is on order.